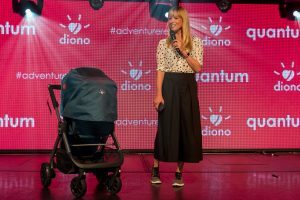 Sara Cox launches the Diono Quantum Travel System #adventureready! Diono were thrilled to have cocktails and canapes with celebrities, press and bloggers at an exclusive product launch on Thursday 1st June in London. The event was held to launch the Diono Quantum, a multi-mode travel system from 0-3 years and the first stroller from the US travel brand. After an exciting performance by cheerleaders, beloved Radio 2 DJ, Sara Cox introduced the Diono Quantum on stage before mingling with guests and entertaining the audience with DJ sets. Sky Sports News presenter, and new mum, Olivia Wayne tried out the stroller on the all-terrain track, posting on instagram “this buggy has got all the moves”. Music producer Nathan Retro and his wife, singer Anjel who have recently released the current hit ‘everywhere’ were also at the party, interacting with the guests and testing out Quantum. The Diono Quantum 6-in-1 travel system launches on 15th June across independent Nursery retailers and from 15th July in Babies R Us. Available in teal from June and black, red and navy from July. RRP £500.